Looking for something simple, and easy to wear in the summer for hot days on holiday or at home then try this striped kaftan dress , with a bold crisp colour way and simple easy to wear style including pockets . Jigsaw has a dress for every occasion from the beach to work or a night out with friends so enjoy the summer in style. The perfect beach to bar piece. This kaftan dress, with a print designed in-house, can be worn with a swimsuit on the beach or teamed with simple sandals and a clutch. Made from a breathable cotton linen blend, it has an optional waist tie, V-neckline and slits on either side for a contemporary look. If you’re favourite tee became a dress. 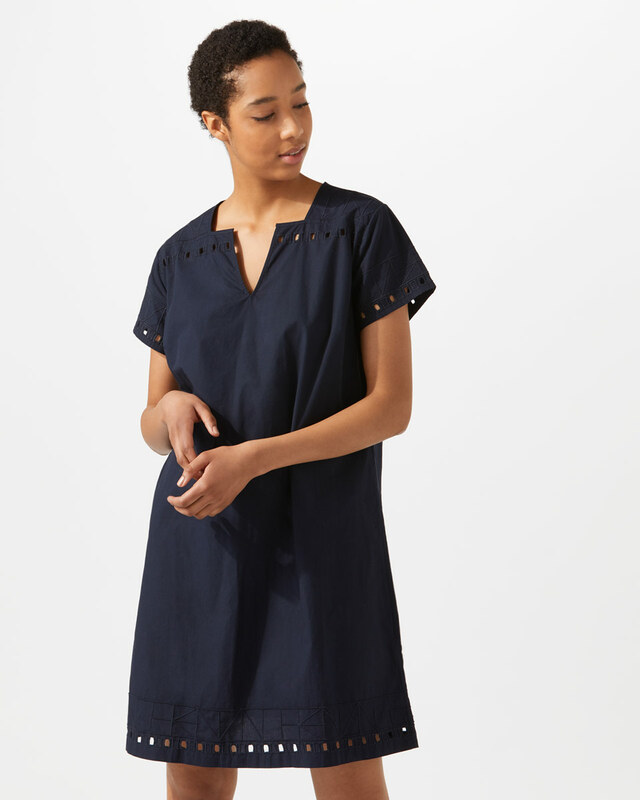 With cap sleeves and a shift silhouette, this dress is ideal for daily outfit conundrums. A no-fuss, no-brainer. Timeless and reliable, further details include a V-neckline and a concealed zip fastening at centreback.